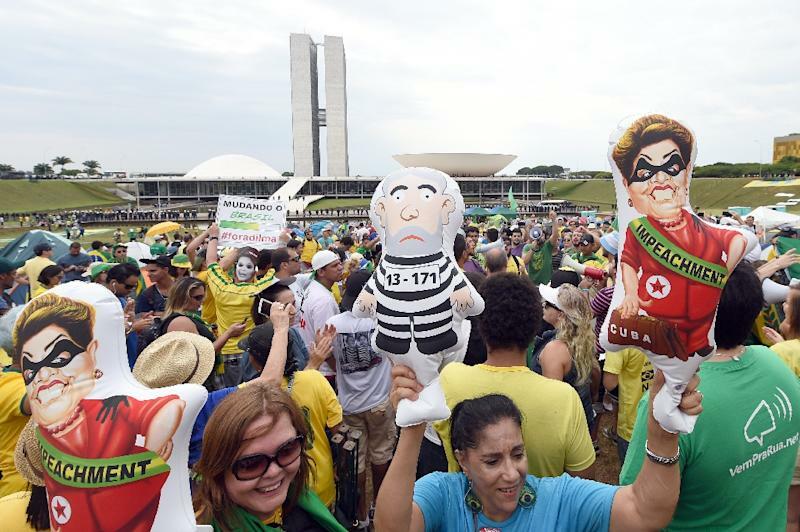 Brasília (AFP) - Several hundred far-right protesters in the Brazilian capital Sunday called for a military coup against unpopular leftist President Dilma Rousseff. The demonstration in Brasilia, featuring a giant inflatable doll of a soldier and coffins meant to represent Rousseff's death, was a rare public display of support for a military takeover in Latin America's biggest country, where a two-decade dictatorship ended in 1985. "We back military intervention as a form of cleansing so that we can put the country back in order, call elections and that way regain democracy," said one protester, a member of a far-right "Patriotic Camp" set up near Congress. He would only give his first name Rodrigo. "It's not a coup, it is just strong medicine, just as if a mother has to give medicine to her son when he is sick," the protester said. But the far-right were a minority in a generally more mainstream crowd of about 3,000 people who gathered to demonstrate against Rousseff. Most at the protest called on Congress to impeach the president, whose second term has been marred by a huge corruption scandal and steep slide into economic recession. "The idea of a military coup makes us sick because we have nothing to do with that group," said Renan Santos, head of the Free Brazil Movement, which was also at the protest outside Congress. "We are sorry that they think they can join us at the protest."